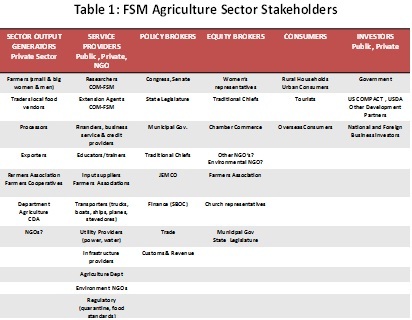 The FSM agriculture sector has been identified as one of the priority areas for economic development, however, the sector has not been productive and growth has been sluggish and stagnant over the last 20 years. Lack of a coherent policy, legal and regularity framework has inhibited strategic action and dissipated the already limited human and financial resources. The FSM Strategic Development Plan (2004-2023) calls for an agreed vision and adherence to a national agriculture policy framework. This Agriculture Policy, which is the conclusion of a participatory consultative process among a wide range of stakeholders across the four states, provides the basis for action by both public and private sectors to invigorate sustainable agriculture growth in the Federated States of Micronesia. It recognizes the major role played by traditional farming systems and the impact of socio-cultural realities. The agriculture sector provides food, livelihoods and employment for a significant proportion of the population. This policy aims to reflect and address the differentiated needs, constraints and opportunities of small farm families who farm primarily for subsistence and more commercial oriented farmers and agri-business operators. The nation faces many challenges in achieving national food security and ensuring sustainable livelihoods for a growing population. FSM economy has contracted in five out of the last seven years, with real GDP falling by 3.6% in 2007 and the weak economy in recent years is reflected in a decline in living standards and in emigration. The trade account of the balance of payments runs a significant deficit reflecting the excess of imports over exports. 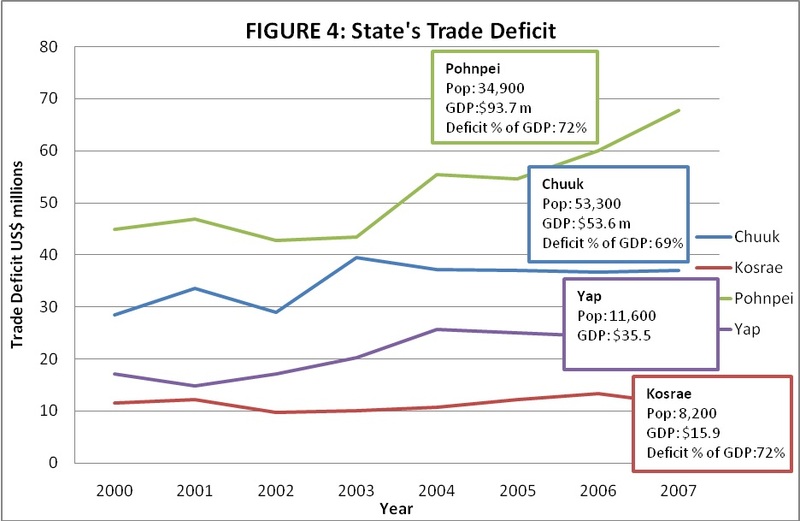 The economy is still firmly dependent on US aid and Compact funding provides about 65% of revenues for national Government and 75% of revenues for the states, and is the major component of balance of payments. Achieving sustainable growth will depend on reforms that support private sector development and increased foreign investment. Export earnings, among other things need to be increased and in particular tourism, fisheries and agriculture have been identified to have development potential. Rising food imports also indicate some opportunities exist for import substitution by locally grown products. 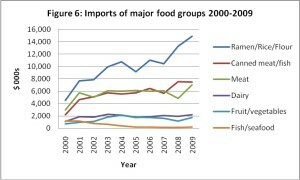 Total food imports have shown a steep increase from around US$17 million in 2000 to US$43.6 million in 2009. Convenience starch foods including rice, ramen, noodles, flour and bread have been the major food items imported and this group has shown a steep rise over the last 10 years reflecting a change in diets away from traditional staples. The soaring global prices for food and oil mean the costs of imports will continue to rise. Food expenditures now dominate household expenditures, particularly for poorer families, with up to half of total household expenditures on food. Nationally, around 70% of households have income below US$15,000 and these households incur annual dis-savings resulting in increased hardship. Agricultural production for food security and livelihoods remains crucially important and must be addressed by a socio-culturally sensitive community-based approach which addresses the different priority needs across the four States. Local production needs to remain the core of the food system and the capacity of FSM farmers to trade their produce locally, regionally and internationally needs to be supported and extended. The Agriculture Policy renews the emphasis on domestic food production in the Federated States of Micronesia with a priority policy focus to national food security and nutritional health through increased food self-sufficiency. It addresses the key challenge of developing pathways for commercialization of smallholder farming systems building on traditional systems and practices, which allow increased employment and cash-generating opportunities for rural households, but without sacrificing family and community cohesion and ultimately food security. An express goal of the policy is that through invigorating traditional agriculture to strengthen socio-cultural safety nets. The natural environment is central to food security, livelihoods and the commodity export industries of FSM. Therefore, sustained growth in the agriculture sector is critically dependent on the sustainable management of the natural resource base. The competing demands on the environment and differentiated impacts of climate change will be assessed and taken into consideration when formulating strategies to address the development challenges the agriculture sector faces. Sustainable agriculture will bring benefits to farmers (through improved incomes), and to consumers (through healthier food choices) and to ecosystems (by increasing resilience). To achieve the agriculture sector policy goals government will focus on maintaining a sound and consistent policy and legal framework and ensuring the delivery of services to remove production constraints for the private sector, such as providing information on markets, increasing know-how, and providing effective business development support and essential infrastructure. The Public Sector main roles will be to invest in core public goods such as data and information, quarantine services, agriculture research, basic extension, infrastructure (e.g. rural roads) and enforcement of property rights, rules and contracts. Although outsourcing in some of these areas and partnering with the private sector and civil society may form part of the implementing agenda. To deliver the anticipated development outcomes in the agricultural sector, institutional reforms (including strengthening the legal and regulatory framework) and better coordination will also be necessary. However, the important roles that traditional institutions and governance systems can play in achieving the sector outcomes are acknowledged and this policy promotes consensus building approaches to achieve common goals rather than over stressing the role of formal institutions. This overarching agriculture policy framework will be the means for coordination of investments from national and state budget revenue together with all other sources of public funds for the sector development (including, but not limited to, US Compact Funds and Federal Programs and Grants, other development partner funds and technical assistance). The government will also use this framework to facilitate and guide private investments in the sector. The Agriculture Policy, which is the conclusion of a participatory consultative process among a wide range of stakeholders, provides the basis for action by both public and private sectors to invigorate sustainable agriculture growth in the Federated States of Micronesia. The Policy signals desired sector priority development outcomes and strategies to achieve these. Successful implementation of this policy should lead to the realization of a shared vision for the agriculture sector across the four states, Chuuk, Kosrae, Pohnpei and Yap. By 2023, FSM will have a vibrant, robust and productive agriculture sector that sustainably supports food security, healthy lifestyles, strong social safety nets, and promotes a greener economy. The sector will provide good employment and income generation opportunities, economic growth and a decreased trade deficit. This will help ensure a happy, healthy, prosperous and peaceful nation. While the Agriculture Policy provides an overarching framework for sector development some elements are purposely generalized to allow for variation according to specific needs and priorities of each state. Stakeholders, during formulation, have indicated broad agreement on the vision statement, guiding principles, policy goals and development outcomes. However, it is anticipated that the national and state governments will refine strategic actions and investments as deemed necessary in the context of specific needs. Some state governments have recently endorsed agriculture strategic action plans which have helped guide the formulation of this policy. The need for an agriculture sector policy that reflects the priorities of all stakeholders was identified in the nation’s Strategic Development Plan (2004-2023) to provide a consistent and agreed vision, to clearly define government’s role in the sector and to strengthen the link between policy and investments (from budget allocation and partner support). Unlike social sectors (e.g. education and health), the majority of outputs of the agriculture sector; production, processing and marketing are delivered by private entities be they farm households, farmer co-operatives or larger commercial operations. Therefore the most important government roles in supporting the agriculture sector outcomes do not necessarily relate to public expenditure directly in the sector, but rather to policy and regularity issues and settings. These include, amongst others, macro-economic policy, pricing policy (taxes and subsidies), land policy, trade policy, factor prices, and sanitary and phytosanitary standards (SPS). But reviving growth in agriculture based largely on smallholder production will involve considerably more than establishing a benign policy framework. Vitally important areas of expenditure for supporting growth in the sector would be necessary in infrastructure (rural roads, bridges, wharfs, ports, market-house and post harvest/storage and quarantine treatment facilities), and in improved transport, communications and education. Finally, the close nexus between agriculture and the natural environment means that future sustainable development in FSM will be dependent on ensuring an environmentally-friendly agriculture sector. Clearly these important areas of influence for creating the “enabling environment” for private sector led sustainable agriculture development lie largely outside the remit of the national and state government institutions directly responsible for agriculture. Thus agriculture policy formation must ensure good communication between a diverse group of stakeholders to build consensus on policy actions and investments. This will require an increased policy focus on coordination between sectors and on enhanced links between institutions and actors at the local, state, national and international levels in order to ensure policy coherence. A lead role in this coordination will be taken by the national government institution responsible for agriculture, the FSM Department of Resources and Development and through the National Trade Facilitation Committee. Agriculture contributes significantly to the livelihoods and food security of a large proportion of FSM’s population and is identified in the SDP, along with fisheries and tourism, as a key productive sector for sustainable economic growth. Whilst commercial agriculture remains relatively under developed, agricultural subsistence activities based on localized small scale family farm production are estimated to still make a substantial contribution to GDP. Food grown in home-gardens and family farms is primarily for local consumption, but also supports small export sales in regional markets, mainly Guam, the Republic of Marshall Islands and Saipan. The two principal export crops over the last decade have been betel nut and kava, and these crops also have a large and growing domestic market. Relatively small quantities of root crops (including cooked products), banana, pepper leaves, peppercorns and citrus are also exported intermittently. Copra was a former ubiquitous cash crop throughout the FSM, but production has now ceased almost completely due to inefficiency, volatile commodity prices, and poor transportation linkages coupled with increasing senility of the coconut palms. Farmstead livestock production (pigs and poultry) is important throughout FSM, particularly for subsistence and cultural use. Agriculture in the FSM can be viewed as more than simply an economic activity as it also provides the means by which what survives of tradition is largely expressed and maintained, and provides a potential channel for individual creativity and enterprise within the traditionally close confines of the extended family and community. Agricultural products including yam, sakau, breadfruit, taro and pigs are crucial for ceremonial purposes and are important for gifting which helps cement social bonds. It is difficult to assign an economic value to such welfare building, and cultural attributes. It is also well recognized amongst sector stakeholders that agriculture serves a central role in ensuring healthy lifestyles, providing social safety nets and preserving traditional knowledge, practices and skills. Indeed, food production on family farms together with subsistence and artisanal fishing continue to be a vital part of food security and provide resilience in the face of external shocks, either economic (price spikes, global recession) or natural (cyclones, floods, droughts etc.). FSM traditional agriculture systems are based on biotic diversity and the practice of polyculture rather than monoculture and have sustainably provided for subsistence livelihoods, community obligations and food security over generations. Properly managed these home garden/agroforestry systems can be highly productive whilst also underwriting important environmental services such as soil stabilization, carbon sequestration, clean water and air. But lagging growth in the FSM economy coupled with minimal exports, a significant imbalance of trade and growing unemployment, especially amongst youth, now justifies a well considered approach leading to increased productivity and greater commercialization of smallholder farms, whilst ensuring that the benefits of the traditional systems are sustained. This can better be assured with clear recognition and appreciation of the potential tradeoffs between increased commercialization relative to the important role and value of existing practices. 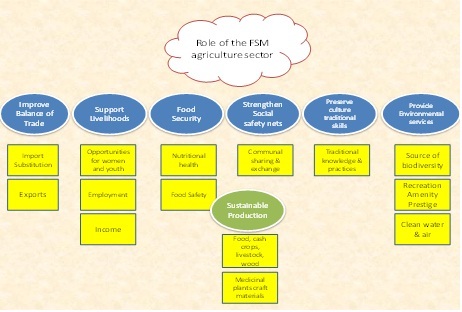 Vitalization of the agriculture sector (including a strengthened local food production and marketing system) is considered an important medium term policy option for FSM. In this period of global economic uncertainty, the nation should anticipate and prepare for a world where food and oil imports will cost far more than they have in the past; investing now in food production will pay future dividends for all our citizens. The Agriculture Policy renews the emphasis on domestic food production in the Federated States of Micronesia with a priority policy focus to national food security and nutritional health through increased food self-sufficiency. It addresses the key challenge of developing pathways for commercialization of smallholder farming systems building on traditional systems and practices, which allow increased employment and cash-generating opportunities for rural households, but without sacrificing family and community cohesion and ultimately food security. 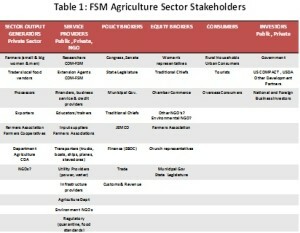 There are many stakeholders to the FSM agriculture sector. The main stakeholders identified are shown in Table 1 and have been grouped according to their roles as sector output generators; service providers; policy brokers; equity brokers; consumers; and investors. This policy promotes private sector-led agriculture growth and recognizes that the private sector – including farmers (big and small), traders, food vendors, processors and exporters – are the major sector output generators. The private sector also provides important services to the sector and it is envisaged that private sector operators, where appropriate, will increasingly be involved in service roles. Private sector organizations (e.g. Chamber of Commerce, Farmers Associations) are currently strengthening their role as equity brokers to provide a voice in policy formulation and ensure equitable outcomes for their members. It is anticipated that consumer demand for higher product quality and standards will also increasingly impact on sector policy. The Public Sector main roles will be to invest in core public goods such as data and information, quarantine services, agriculture research, basic extension, infrastructure (e.g. rural roads) and enforcement of property rights, rules and contracts. Although outsourcing in some of these areas and partnering with the private sector and civil society may form part of the implementing agenda. Where government does find it necessary to intervene because of market failure to provide adequate services, it will attempt to do this in the least distorting manner, with the aim of fostering equitable growth and with implementation through a constructive dialogue with the private sector. Any government support in the market will be for time-bound interventions that aim to stimulate an effective private sector response. Where government currently undertakes a role as an output generator this role will be reviewed with the aim to transition responsibility to the private sector. Government will continue to strengthen its key roles in facilitation, coordination and regulation to create an enabling environment for the private sector to operate. Stagnant economic activity, limited employment opportunities and an increasing incidence of poverty are the priority development issues government faces. The agriculture sector provides a solid basis for food security, but also offers significant (as yet under-exploited) opportunities for gainful employment and income generation. Farming as a business needs to be more fully developed. Complex political and institutional structures, bureaucratic channels for communication and limited human resource capacity have combined to inhibit leadership and coordination in the agriculture sector. Without strong leadership and good coordination investments are ad hoc and poorly oriented to sector priorities. Lack of a coherent policy, legal and regularity framework has inhibited strategic action and dissipated the already limited human and financial resources. Accessing reliable data is a significant issue and poses a serious challenge to monitoring the agriculture sector performance and the effectiveness of policy and investments. Lack of data constrains efficient planning and budgeting for the sector. Without good sector data it is difficult to assess development outcomes and draw lessons. Subsistence activity is still considered to be very significant, but there is lack of data and poor understanding in this area. Without specific-information on amounts of food available and the potential to produce more a solid statement on food security and vulnerability is difficult. In the absence of an agriculture census basic structural information on the sector is not available to provide baseline data on the production and economic value and use of existing agricultural systems. Equally without regular surveys and reliable administrative data sources monitoring production trends and trade in agriculture commodities is severely constrained. Insufficient budgetary allocation to the agricultural sector continues to be a key constraint which has reduced human resources and service delivery by government institutions. The SDP envisaged that the budget share allocated to agriculture would increase to 3% of total by 2009, but in fact budget allocation at state level has been stagnant or in some cases declining. Government support activities increasingly depend on ad hoc project funds which threatens the sustainability of service provision. The Agriculture Sector needs a level of funding that recognizes its status as a “priority productive sector” and a major source of employment. However, with continuing fiscal constraint and need to keep a balanced budget prospects for increases in budget allocation for agriculture are not good. It will therefore be critical that available funds (including those from development partners) are well coordinated and targeted to prioritized policy actions and service provision is streamlined and efficient. The nation is highly vulnerable to global food and commodity prices as a net food importer with an increasing reliance on food imports. Because of our isolated location and geographical formation (many dispersed islands) fuel prices are also a very critical issue. A large and increasing trade deficit without significant merchandise or services exports increases vulnerability to global commodity prices and undermines macroeconomic stability. The agriculture sector provides opportunities to increase export of goods, but currently trade in agricultural products is minimal. There is also some opportunity for local fresh and processed produce to substitute for imported goods and thus to reduce risks associated with any restrictions of imports should there be any balance of payments problems in the future. Serious problems of nutritionally-related diseases occur in FSM, including vitamin A deficiency and anemia among children, diabetes, heart disease, and certain cancers among adults. These nutrition problems are mainly linked to the types of food eaten which is influenced not only by personal choices, but also by cost, ease of preparation, availability and accessibility. Increasing levels of food and nutrition related non communicable diseases impacts negatively on families, the health system, and the economy. With many border entry points to FSM and increasing passenger and cargo traffic the threat from invasive species and trans-boundary pests and diseases continues to escalate. Such incursions, if and when they occur, pose a significant threat to local ecosystems, agricultural production, human and animal health and food security. Furthermore, the nature and prevalence of agricultural pests and diseases is a critical factor in gaining market access for potential export products. Value addition includes processing, branding, quality certification and accreditation, as well as farm-level quality improvements that the market values. Processing and value adding of agricultural products is very limited and at a very basic level of development. Lack of investment capital, limited technical, entrepreneurial and business skills, and inconsistency in supply of quality primary products, together with expensive and unreliable utilities and transport all constrain agribusiness development. The coconut is an integral part of island life and coconuts remain an important sustainable asset base in the FSM. But the commercial coconut sub-sector is currently moribund. Coconuts account for the largest area of agriculture crop planted and the fact that most farmers grow palms offers good prospects for substantial value addition through appropriate developments based on whole nut processing. WEAK MARKET LINKAGES AND LOW COMPETITVE ADVANTAGE OF LOCAL AGRICULTURAL PRODUCTS. An essential precondition for any successful productive enterprise is that there must be a sustained market for the product that will assure producers consistent and attractive financial benefits, and give producers the confidence to make the necessary investments and changes in practice to supply these markets. In times of a strong and sustained market demand farmers will more actively seek and adopt productivity enhancing technology and management methods. Currently poor market linkages coupled with weak facilitation curtails market opportunities and the consequent market demand that is needed to stimulate smallholder commercialization. Furthermore, diversification of marketable products is needed as commercial agricultural currently is largely focused on two cash crops – sakau and betel nut. Lack of accessible and sustained markets for agricultural products which FSM farmers can produce competitively is currently the biggest constraint to growth of commercial agriculture. The increasingly strict SPS standards required to access overseas markets is a major constraint for exports. Equally, high product quality and food standards are required to access domestic tourist food markets. With increasing reliance in the local market on food imports, safety standards and inspection is also a critical public health issue. But FSM currently lacks the institutional architecture to regulate SPS standards. The national food control system in the FSM faces a number of challenges, including weaknesses in food legislation and regulations, inspection, laboratory analysis and quality assurance. At the same time, small and medium sized enterprises (SMEs) are lacking the fundamental knowledge about safety and quality assurance schemes and this is preventing them from taking advantage of potential market opportunities. To participate in the more demanding markets, investments in product and process upgrading will be a prerequisite together with training for both the public officials and private sector to monitor and meet prescribed standards (e.g. Codex, HACCP, Organic, etc.). Accreditation and certification systems will need to be established and maintained along with appropriate storage, labeling and packaging for certified products. Good municipal market houses can make a major contribution to small business development and increase opportunity for sales of nutritious local produce. But states have not invested sufficiently in market infrastructure as a means to stimulate local food production and improve rural incomes. Successful agricultural enterprise is generally private sector driven with profit as the foremost objective. A culture of entrepreneurship with associated skills in business practice is not widespread in rural areas. Appreciating the importance of cultural norms will be critical in developing appropriate support strategies for small farm development. It will also be important to orient extension services to provide a more market-driven and farmer-demand approach. The nation is extremely vulnerable to natural disasters and the impact of climate change. The vulnerability of food and farming systems to the new fundamentals of climate change and scarcer, costlier oil is not well considered in current policy. There is insufficient consideration placed on adaptation and resilience within food and farming systems especially in terms of biodiversity, sufficient skilled labor and supporting infrastructure that a low –carbon, more resourced constrained future necessitates. Forests and trees have a significant role in mitigating the impacts of climate change. Forests contribute significantly to biodiversity, protection and maintenance of ecosystem services. Unfortunately, despite their essential role in sustainable development these valuable resources are under continuous threat from destructive human activities associated with agricultural clearing, firewood collecting and logging. Biodiversity promotes ecosystem services important amongst which are: food production, provision of raw materials, recreational opportunities and cultural values. Expansion of agriculture into upland watersheds, land degradation and pollution are issues that further contribute to undermine ecosystem resilience in FSM. Effective land-use policies and practices are required along with appropriate regulations and enforcement. With the execution of Compact Fund step-downs resulting in fewer public sector jobs young people will increasingly need to turn to other sectors for employment and livelihood opportunities or to emigration. With close to 60% of the population under the age of 25 and very limited employment opportunities in the formal economy agriculture continues to provide subsistence livelihoods for individuals with limited education. But for those with improved technical training and entrepreneurial skills the agriculture/ agri-business sector could offer good income earning and employment opportunities. Poor domestic and international transport linkages (both air and sea) are widely conceived as critical issues for trade in agriculture products. Transport linkages also pose a real threat to food security particularly for outer island residents. Efficient and competitive air transport is also vital for growth in the tourist sector. Improving transport linkages is one of the highest development priorities for FSM and warrants political intervention and advocacy at the highest level. Currently the biggest agriculture export volume is in betel nuts, but much of this product is air transported as passenger cargo. Whilst there are regional and international shipping carriers servicing the four states and linking to Guam (bi-weekly and tri-weekly) these operate mainly for import cargo. Better coordination between exporters (to combine volumes to fill containers) and freight operators is needed to realize potential opportunities for sea freight of agriculture export commodities. Agriculture sector growth will depend on the capacity of a great many players interacting and cooperating together, but weak sector capacity has been identified as a critical constraint limiting sector performance. Formal training in agriculture has been undersubscribed and there is a dearth of need-based and opportunity-based technical and vocational training in agriculture. Whilst many specialists currently working in the sector are approaching retirement there is no clear plan for succession. The effectiveness of extension services generally has declined over the last two decades due to use of inappropriate methods, inadequate operational budgets and limited human resources. Unless extension agents have the skills, funding and mobility to work at the municipality level, the vital delivery of training and information will continue to leave farmers without vital information on sustainable food production and opportunities for increasing their cash earning from agriculture. Agriculture and Tourism are two principal sectors identified in the SDP to generate sustainable economic growth. Goal 6 for the Tourism Sector is to promote inter-sectoral linkages and maximize use of local produce and services. Growth in tourism numbers could provide a substantial market demand for quality local produce, but equally, local produce creatively used in hospitality menus could support FSMs unique tourism brand. Furthermore, well managed farms and processing operations can have substantial amenity value and thus serve as tourist attractions. Farm-tours and farm-stays are already becoming available in some states and there is good opportunity to expand and link these as part of the cultural experience for visitors. Strengthening linkages and exploiting synergies could bring increased opportunities and mutual benefits for both sectors. Increased sustainable production (and productivity) of traditional farming systems to provide for household nutrition, traditional needs and cash incomes. The Agriculture Policy endorsed by all key sector stakeholders and adopted by the representative governments at the municipal, state and national level provides the overarching policy framework for the sector. This will entail strengthening institutions responsible for coordinating, facilitating, delivering and monitoring services to the sector as well as strengthening the private sector operators as the engine of growth. Recognizing the potential scale of the task, the first step should be relevant capacity assessments to identify needs for delivery of the strategic outcomes of the Agriculture Policy. Capacity building for entrepreneurship and in business skills requires a priority policy focus and may entail revisions in formal education curriculum as well as more grass roots approaches which encourage innovation and enterprising behavior. It will also be important to strengthen the human resource capacity of current extension staff, such as training them to use more participatory methods, and to increase their technical, management, and marketing skills. 2.1.1 Develop a comprehensive strategy to improve access to Vocational Education. 2.1.2 Ensure that capacity building and strengthening partnerships are key components in all government (and development partner) supported agriculture programs. Where appropriate use mentoring approaches. 2.1.3 Strengthen small business enterprise support services. 3. INCREASED SUSTAINABLE PRODUCTION (AND PRODUCTIVITY) OF TRADITIONAL FARMING SYSTEMS TO PROVIDE FOR HOUSEHOLD NUTRITION, TRADITIONAL NEEDS AND CASH INCOMES. Government recognizes that traditional farming systems are an important component of livelihoods and properly managed have proven productive and sustainable. Therefore building on these systems, to enhance productivity and efficiency, will be the guiding principle for government interventions and support. Given the limited potential for larger plantation development and the dearth of investment capital for the agriculture sector, raising production volumes will be primarily dependent on increasing smallholder production. Small farmers face significant challenges to increase productivity (land and labor). More attention needs to be focused on maintenance of soil nutrients, pest control and disease management for long-term sustainable yields. Practices must also seriously consider labor productivity, recognizing that return-to-effort is a key motivational factor for small farmers. Whilst international best practice is established in regions of the world, more attention needs to be focused on adaptive research and appropriate technology transfer in FSM. Facilitate coordination between research providers at state, national, regional and international levels. Review current research priorities and activities in the sector and ensure alignment to the agriculture policy framework. Explore feasibility of establishing a national agriculture research centre in partnership with COM-FSM. Give increased attention to economic and social research. Improve dissemination of research results to target groups. Protect and evaluate traditional crop diversity. Test improved genetic material (crop, tree and livestock) for adoption into traditional farming systems. Review extension provision across the nation to develop an appropriate and affordable extension model that addresses stakeholder needs. Ensure adequate allocation for operation costs in budget preparation (recommended ≥50%). Adopt participatory and community-based approaches to promote local food production, healthy lifestyles and sustainable diets. Ensure extension programs are gender focused and gender responsive. In the context of high food prices recruit technical assistance to review current policy settings across the four states, recognizing the need to improve incentives for producers, but also the welfare of food deficit households. 3.1.4 Strengthen resources and capacity of small business enterprise support services. Enact harmonized bio security legislation and regulations. Government recognizes that increased production and marketing will ultimately be dependent on private sector activity and will thus strive to create an enabling macroeconomic and policy environment conducive to private sector led growth in the agriculture sector. The recently adopted FSM Trade Policy identifies some key actions in this area. At this stage of FSM’s economic and private sector development, supporting market linkages for the majority of smallholders/rural population remains in many areas a public good. Also possible use of targeted subsidies to address market failures may need to be considered (examples could be for inputs, transport and information). When subsidies are considered these will be “market smart” with the aim not to distort markets for private sector activity. Government recognizes that it is the private sector traders who ultimately are the most important and sustainable link for farmers to markets, for outputs, inputs and useful information. Currently there is heavy reliance in commercial agriculture on two main crops – sakau and betel nut, this increases vulnerability to market shifts and natural events (e.g. outbreak of pests or diseases). To reduce vulnerability strategies will focus on diversification of potential marketable products as well as increasing market opportunities. A key constraint is lack of information and understanding of market opportunities and processes. A robust domestic market for a potential export product, which is the case for sakau and betel nut, helps reduce the vulnerability of farmers to fluctuations in the international market. Identify priority commodity supply chains for import substitution and export markets. Establish regular dialogue between all stakeholders in the priority supply chains. Facilitate and support formation of producer groups, farmers’ organizations and associations. Assist in identifying (and solving) specific constraints to supply chain efficiency. Train farmers to target off-season production for different commodities in order to avoid over-supply and the inherent low seasonal prices. Support effective participation in trade shows, missions and promotions. Domestic wharves and port facilities. Municipal market houses, food preservation and warehouse facilities. 4.2 IMPROVE QUALITY, SAFETY AND CONSISTENCY OF SUPPLY. Meeting sanitary and phytosanitary requirements for new export markets will be challenging, and will require concerted action by government. Furthermore, if small-scale farmers are to consistently supply different high-value crops, livestock, and other products to markets, then they must organize into producer groups so they can jointly market their products. Review food laws and regulations at national and state level to develop comprehensive and coherent food laws and regulations which are harmonized across the nation. Review food analysis needs and elaborate proposal to establish a national food laboratory. Recruit technical assistance to provide training in food safety, phytosanitary and other market access requirements. Implement training programs for food inspectors and private sector enterprises in the food industry. 4.2.3 Encourage and facilitate formation of producer groups and associations to coordinate consistent supplies of high quality marketable products to meet market demands. The associations should be encouraged to develop business plans to ensure they can be sustainably operated and funded. 4.2.4 With full participation of private sector establish quality standards for priority marketable products (e.g. sakau). Explore possible private sector – government partnership opportunities to establish a feed mill processing local materials for poultry, pig and aquaculture feeds. 4.3 IMPROVE QUALITY, SAFETY AND CONSISTENCY OF SUPPLY. 4.3.1 Along with strengthening domestic market opportunities improving agricultural export trade will also be vital for sustained growth in the agriculture sector and to improve the merchandised trade balance. Through the Division of Trade and Investment, the government will continue to seek favorable trade agreements with key trading partners. Traditional food production systems have provided the resilience to withstand natural disasters and external economic shocks. Building on these traditional systems (including agroforestry) and developing value added marketable products from them would help to ensure that subsistence security is not sacrificed in the drive for greater productivity and economic growth. The aim is to process primary products (to alleviate quarantine issues and extend shelf life), to add value (to offset transport costs) to reduce volume (to lower freight costs) and to brand (to differentiate and make distinctive). Developing domestic market and export opportunities based on traditional crops would ensure strong backward linkages to the rural communities who have the experience and the resources to produce them. It should involve significantly less risk than ventures into new exotic crops and would protect the subsistence base thus strengthening food security. Identify appropriate potential products for processing and value addition. Facilitate technical support for market and cost benefit analysis prior to advocating development of new value added products. Facilitate technical support for appropriate processing technology and practices recognizing economies of scale, utility provision and costs, product quality and safety standards. Consider duty concessions and fiscal incentives for capital investments to support nascent manufacturing enterprises. Undertake a strategic review of the coconut sector and the role of CDA and the private sector in development of profitable value added coconut enterprises. Facilitate mentoring and sharing of experiences in coconut processing and marketing from regional neighbor countries [e.g. Vanuatu (bio-fuel), Samoa (virgin oil and timber) and Fiji (oil products and timber)]. Design tailor made credit packages for small-scale producers to facilitate access to key inputs. 6.1 Government will facilitate a review of transport (air and shipping) services with the aim to identify constraints and evaluate opportunities and actions to improve freight and passenger services to stimulate growth in the productive sectors. 6.2 Government will consider supporting a dedicated freight coordinator working closely with the office of the Micronesian Shipping Commission to liaise between private sector exporters and shipping agents to facilitate better freight opportunities and solutions. In direct support of the SDP Tourism Goal 6 “Promote inter-sectoral linkages and maximize the use of local produce and services” the following strategies will be implemented to increase linkages and synergies between the agriculture and tourism sectors. In cooperation with farmers associations and tourism sector strategically re-orient the production operations of small-scale farmers to meet needs of hotel/restaurant sector taking into account the variables impacting on hotel/ restaurant demand. In cooperation with tourism industry associations (visitors’ bureaus etc) explore opportunity for promoting local foods in restaurant and hotel kitchen menus. In cooperation with tourism associations (visitors’ bureaus etc) explore opportunities for agriculture tours and farm-stays. 8.1.2 Government will support and facilitate community-based approaches for management of natural resources. 8.1.3 Government will strengthen regulatory frameworks and enforcement to encourage sustainable farming and protect natural resources and prevent pollution adopting a “polluter- pays” principle. The impacts of climate change will be assessed and taken into consideration when formulating strategies to address the development challenges in the agriculture sector. Policy implementation will require bringing together multiple agencies and groups that are intended to work in concert; effective coordination will therefore be fundamental to success. There will also need to be an assessment and possible redefinition of roles of government institutions supporting the sector to ensure appropriate support and regulatory services are provided in the most efficient, streamlined and cost-effective manner to achieve the anticipated policy outcomes. the Division of Agriculture in the Yap State Department of Resources and Development. (Refer to Annex 4 for organizational charts for these agriculture agencies). In addition, the Land Grant Cooperative Research and Extension (CRE) programs are extended in FSM by the COM-FSM through a Memorandum of Understanding (MOU) with the College of Micronesia (COM). COM-FSM Cooperative Extension Services (CES) programs are based at State Campuses which also house Agricultural Experiment Stations that conduct agricultural research. COM-FSM also provides Resident Instruction (RI) programs which include associate degree programs in general agriculture and natural resources and certificate in agriculture programs at Kosrae and Pohnpei State campuses. CRE support for the RI program is through special project funding under the US Department of Agriculture (USDA). Pohnpei State and COM-FSM have an MOU that mandates COM-FSM to deliver the State’s agriculture extension programs with matching funding from COM-FSM and Pohnpei State. COM-FSM Cooperative Research and Extension key program areas are in Aquaculture, Small Island Agricultural Systems and Food, Nutrition, and Health. Limited staff, budgets and human resource capacity severely constrains the level of support services provided by government agencies and COM-FSM. Government expenditures for agriculture sector support services currently focus on salaries, whilst expenditures for nonwage operational costs and new investments are limited. Many activities are funded under ad hoc project budgets which may have priorities that are not fully aligned to national goals and agriculture sector outcomes and limits the long-term financial sustainability after project funding has ended. The absence of an agreed agriculture policy framework has exacerbated the situation. The Agriculture Policy can facilitate closer cooperation between SBOC office, national Resource and Development Department and state agriculture agencies to improve coordination and direct development financing to prioritized programs to achieve the desired development outcomes. The Policy should also help enhance coordination and collaboration among government, non-government and private sector stakeholders. A priority will be for the government agencies to review and prepare clear mission statements and corporate plans that indicate how they will contribute to achieving the development outcomes that have been identified in the Agriculture Policy. This process should involve an analysis that examines/reviews the core functions that must be performed by the agency to meet its mandate, and mission to effectively contribute to implementation of the agriculture policy. It should also consider the organizational structure, and the human and financial resource needs to effectively perform agreed functions and how these resources will be obtained. It should aim at ensuring that there is no unnecessary duplication of efforts with other organizations, there are no conflicts of interest, and that transactions costs in delivering the agriculture policy are reduced. Pragmatism will be essential in the approach to undertake these reviews and any resulting structural reforms. Community groups and NGOs (e.g. Island Food Community in Pohnpei, any other examples?) have been and will continue to be vital players in the delivery of agriculture development outcomes. These organizations help ensure grassroots involvement in needs assessment and planning. Bringing rural communities into the decision making process encourages greater self-reliance, responsibility and local level initiative for the development of agriculture. Government will seek to strengthen partnerships with NGOs and community organizations working in the sector and where possible and appropriate encourage and support service provision by them. Small Business Development Centers which assist the development of small businesses are located in each of the four states. They provide business advisory services and training and in some cases help clients to prepare loan applications. Chuuk, Kosrae, and Yap SBDCs have become part of the University of Guam’s Pacific Island Small Business Centre Development Network (PISBCDN) and are partially financed by the United States Small Business Administration under cooperative agreements. Funding is supplemented by grants from the Compact of Free Association, which are expected to continue to 2023.The SBDCs in these three states therefore have a sustainable revenue stream to continue their support for small business development; however, Pohnpei SBDC remains dependent on budget appropriations of the state government. SBDCs have generally recorded increases in the annual number of trainees and community awareness programs, but the agriculture sector has not yet managed to take full advantage of these services. An effective “farmers’ voice” should be the real basis for agricultural development. But in practice many sections and sectors of the society are ready not only to tell the farmers what they should do, but even worse, to speak on their behalf. Indeed, the lack of farmers’ voice is often unnoticed, precisely because of the enthusiasm with which other people are ready to speak on behalf of farmers. Unfortunately, during periods when farmers do speak, farmers’ voice is more readily seen as something of a problem! Farmers’ organizations, which are run by farmers for farmers, are recognized as essential for giving farmers a voice. Nascent farmer organizations are currently active in all states and need to be carefully nurtured in their growth. This policy promotes the formation of effective farmer associations that can help facilitate farmer access to inputs, credit, output markets, market research, and technical training and which improve coordination within the smallholder sector. Government will support efforts to build their capacity in organizational and financial management and democratic processes that fully includes and enhances the role of women in the decision making process. Government will aim to interact with farmers organizations in a way that recognizes that they represent the private sector and that they are not development agents. Improving the performance of the agriculture sector will also require strengthening of the legal and regulatory framework to encourage business investment and to promote sustainable resource management practices and protection of biodiversity and the natural resource base. The pace of reform in this area will be governed by political economy constraints related to the complex political and legislative structures in the FSM. As far as is appropriate and possible harmonization will be sought in the legal and regulatory frameworks across the four states. Priority areas for harmonized legislation to be enacted are in food control and bio-security. The four States of FSM have strong cultural identities and dynamic traditions in which agricultural production and agricultural products play an integral role. Traditional obligations and service will often take precedence over individual material gains. Therefore culture and tradition needs to be at the centre of agriculture development policy. Social capital which is gained through traditional community networks and trusted relationships should be marshaled and used positively and proactively to promote cooperative actions and sustainable practices. The important roles that traditional institutions and governance systems can play in achieving the sector outcomes are acknowledged. This policy will promote consensus building approaches to achieve common goals rather than over stressing the role of formal institutions. The strategy implementation framework should be broken down into a number of mutually supporting priority programs designed to deliver the eight development outcomes. Each program will need to be translated into a fully costed operational plan for implementation during the period 2012-2016. Both recurrent costs (operational and personnel), and development or capital costs (existing and proposed pipeline capital investments and technical assistance) should be included in the plans. Together these plans will form the basis of a Medium Term Expenditure Framework (MTEF) for the sector. In turn, the MTEF will be used as the point of reference in preparation of annual budget estimates submitted to SBOC. The implementation of each medium-term plan shall be underpinned by an integrated and holistic approach carried out through priority thrusts and associated interventions for addressing the priority agricultural sector challenges and constraints. Implementation of the plans will incorporate joint planning and participation (facilitated by the APWT) to ensure that multiple views, needs and concerns in resolving priority agricultural sector issues at different levels are taken into account and negotiated. The planned thrust areas will be addressed through nationally coordinated programs and with projects implemented at national, state, municipal and community levels. Networking and sharing lessons learned will be used to improve program and project outcomes. Better working relationships and partnerships among public, private and development partners will be established and maintained. 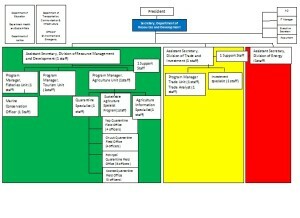 To ensure proper alignment of results down the planning levels, the development of the implementation plan shall pick up the planning process from the intervention strategy level under each of the 8 development outcome result areas, as outlined in the Policy Strategic Action Matrix (Annex 4), and unpack each intervention strategy into its necessary broad-based activities. Activity delivery timeframe, responsibility for carrying out each activity, the intended users of the activity results, and the expected outcomes following the attainment of the activity will follow. This information shall be summarized into an appropriate format. The cost of implementing each medium-term plan of the strategy shall be contained in the MTEF. The cost of implementing the strategy will be shared among national and state governments, development partners and the private sector. An effective and affordable monitoring and evaluation (M&E) system will be essential to ensure that policy directions are achieving desired policy outcomes and impact. This will require initially that there is sufficient baseline data in place, and subsequently, systematic data collection on relevant indicators. Good monitoring will allow appropriate adjustments to the policy framework as implementation unfolds. Effectively demonstrating the quality and impact of resources should help facilitate increased commitments to the sector. Currently there are severe data limitations for monitoring sector outcomes and a first priority will therefore be to establish a minimum set of core indicators that need to be measured. It will then be important to ensure the relevant data is collected in any future agriculture surveys, HIES, Demographic Health Surveys, nutritional surveys, and Population Census. At the development outcome level the M&E Matrix below identifies broad indicators that should be tracked. At the strategy outcome and activity output levels indicators, data and targets will need to be established at a more disaggregated level to reflect individual state priorities. The APWT under the leadership of the national Resources and Development Department and in close cooperation with SBOC will be responsible for establishing the M&E framework and preparing regular policy implementation reports. Annual reports should be prepared to feed into the budget preparation process. The policy will be subject to a mid-term evaluation no later than three years after its endorsement by Congress. Good reporting on results will provide policy managers and sector stakeholders the opportunity to reflect on what has and what has not worked and feed these lessons into future planning. The Policy will be updated after the completion of the evaluation or sooner if necessary. Public spending on agriculture (including development partner funds) as a percentage of GDP. The Federated States of Micronesia (FSM) is a small Pacific nation with a population of about 102,000 situated in the western Pacific Ocean. The nation attained self-government in 1979 when four of the seven districts comprising the Trust Territory of the Pacific Islands ratified the Constitution of the Federated States of Micronesia. Under the newly-formed federation, the former Trust Territory districts became the States of Chuuk, Kosrae, Pohnpei, and Yap. Each state has its own executive and legislative bodies and authority is highly decentralized, with state governments being significantly larger than the national authority. The country retains a close relationship with the United States of America through the Compact of Free Association, which provides substantial funds for the government. The renewed Compact effective since 2004 steadily lowers grant transfers to the FSM through 2023. Thereafter, the FSM is expected to complement its domestic revenues with returns from its Compact Trust Fund (CTF) and other savings (Box 1). Annual grant assistance starting at $76.0 million in the initial 3-year period from 2004-2006, then steadily declining from 2007 to 2023 as an additional $0.8 million each year is taken from grant and deposited in Trust Fund along with an annual deposit of $16.0 million by the US. The Trust Fund is intended to replace annual US grant assistance beginning in 2024 following the end of Compact II. The annual grant is to be allocated to six sectors: (1) education, (2) health, (3) private sector development, (4) capacity building in the public sector, (5) environment, and (6) public infrastructure. Allocations are to be determined in accordance with sector development plans prepared by the FSM, consistent with annual sector grant proposals made by FSM, subject to policy review and discussions annually by the Joint Economic Management Committee (JEMCO). Voting membership of JEMCO includes three members from US and two members from FSM. Policy decisions are in accordance with majority vote. Additional grant and program assistance is made available under Section 221 (of Title Two – Economic Relations). Stipulated programs include US Weather Service and Postal Service, and grant assistance to education and health sectors under the Supplemental Education Grant (SEG). The SEG amount is not set and will vary from year to year. Additional US federal grant assistance is available on a competitive basis with other US states and territories. Available funding is ultimately dependent on US Congressional appropriations. The FSM is comprised of more than 600 small islands (65 inhabited) and the geographic dispersion of the islands has resulted in an Exclusive Economic Zone (EEZ) of approximately 1.0 million square miles (1.6 million km2); one of the largest tuna fisheries in the Pacific. While the FSM includes numerous islands, the total land area is only about 271 square miles (701 km2).The physical isolation of the country, and the States from each other, pose particular development challenges. Economic growth has been negative or very low over recent years (Figure 1), and has also experienced high volatility over years and between states. 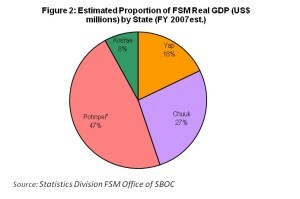 The proportion of FSM overall GDP by state is shown in Figure 2. The structure of the FSM economy is dominated by a large public sector with a dependent non-traded goods sector providing services to Government and its employees together with a significant subsistence production for home consumption. Economic activity is largely driven by the rate of disbursement of Compact funds. The absence of any sizeable traded goods production indicates the magnitude of the challenge facing the FSM in its strive to become more self-reliant .The remoteness of the islands and their relatively small markets, limited private sector development, and vulnerability to natural and economic external shocks all contribute to relatively poor economic performance. The surge in global commodity prices and the global financial crisis has taken a toll on the FSM economy and the value of the CTF has declined significantly (estimated $23 million net loss). 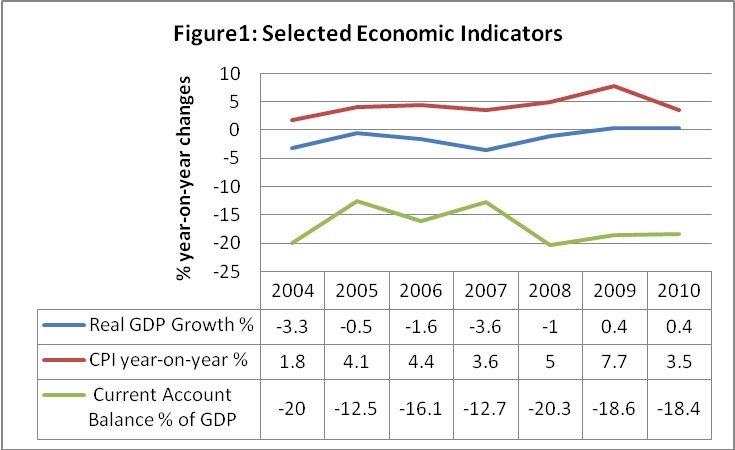 The economy contracted from 2004 to 2008 (with some variation amongst states) and registered very small growth in 2009 and 2010. The spike in food and fuel prices and the global recession have made it abundantly clear that FSM needs to strengthen and strategically diversify its economy to build resilience to economic shocks and prepare for declining levels of Compact support. To become more resilient to future changes in transfers and to reduce the current levels of dependence on government-directed and financed development, the tradable sector must be expanded through private sector activity. Clearly, the policy environment will be critical to achievement of this objective. 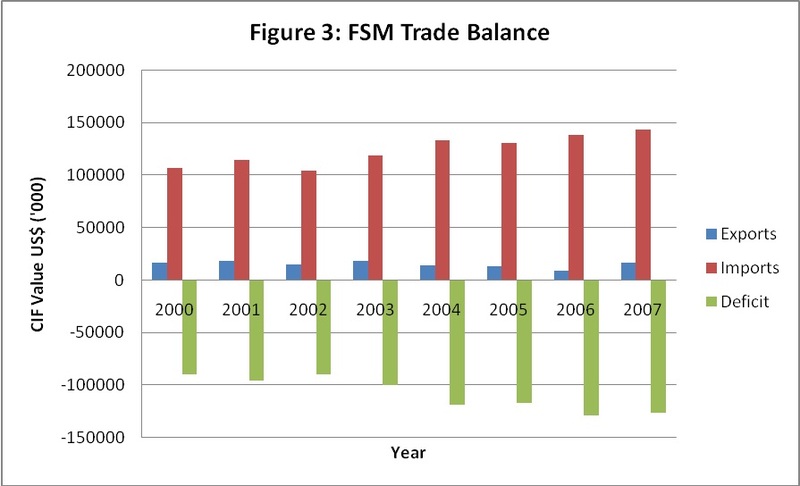 FSM runs a large trade deficit with merchandised imports being around 10 times larger than exports (Figures 3 & 4). 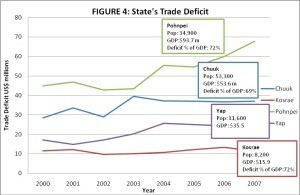 The current account deficit is moderated largely by aid flows, together with modest tourism earnings and remittances. Declining levels of Compact fund flows will put increasing pressure on the balance of payments. 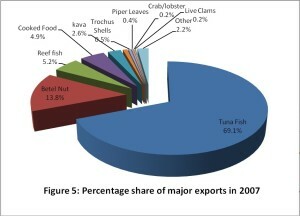 FSMs exports (in 2007) represented about 8 percent of GDP and fisheries and agriculture products formed the main component of the small export volumes (Figures 5 & 6). The majority of agriculture exports are sourced from Yap (mainly betel nut), and Pohnpei (mainly sakau), whilst the exports from Chuuk (cooked foods, root crops and bananas) and Kosrae (citrus, banana and root crops) are very small. However export data (based on quarantine reports) is of dubious quality and subject to significant data gaps. Informed opinion is that the official figures considerably under-estimate export volumes and value. Significant challenges for export are quality and consistency of supply to meet potential market demands, meeting exacting SPS standards, and expensive and limited freight services. Commercial exports in FSM are generally niche agricultural industries that pop up when occasion offers and which can expand or contract according to market conditions, the cost of production and delivery. In the early 1990s, for instance, bananas became a sizeable export but have dropped sharply in recent years. Exports of bananas from Pohnpei to Guam have been affected by high air freight costs and this makes it difficult for these bananas to sell in Guam. Another problem is that exporters cannot produce enough bananas to fill the big containers. Also penetrating the US market after 9/11 is now difficult because of security reasons. For example, if you were not a known shipper to the US before 9/11, it will be difficult for you to export to the US now. Pohnpei pepper, used to be an important export product some years ago, but the production capacity is now low. It is reported that a very successful high-end pepper product failed, when the government intervened on behalf of disgruntled pepper growers who wanted processors to buy all of their harvest, instead of only the best pepper. The other problem is that a government-financed and operated pepper processing plant competed with the private sector pepper manufacturer, leading to the collapse of that industry. It is alleged that poor government decisions and the emergence of a strong sakau (kava) market contributed to the demise of the pepper exports. The earlier exports have declined but other new products have replaced them. 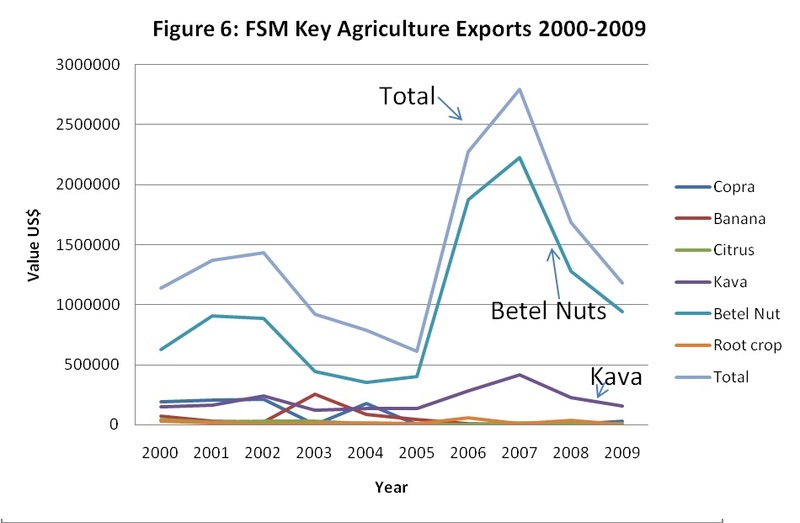 For example, sakau exports were worth about $416,000 in 2007, while the exports of betel nuts have risen to about $2.2 million in 2007 (Figure 6). 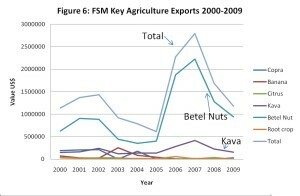 Betel nut and sakau now top the list of agriculture exports. Most of the sakau crop is consumed locally but about 272,000 kg are exported annually. The main markets for sakau and betel nuts are Guam, Hawaii, RMI and Saipan. These crops are grown mainly by traditional, semi-subsistence farmers. Another example of opportunistic exports is exports of cooked food, which now brings in more money than copra. Chuukese pounded breadfruit (kkon) and Pohnpeian banana pudding (pihlohlo), among other island foods, are being distributed and marketed to the growing FSM emigrant population overseas. Bananas, breadfruit, cassava and taro can be processed into flour, chips and can be dried and stored for future use. Guam, RMI and Saipan are also potential markets for root crops and other horticultural products. Processed noni juice and fruit have some potential in niche export markets especially in Japan and possibly China. 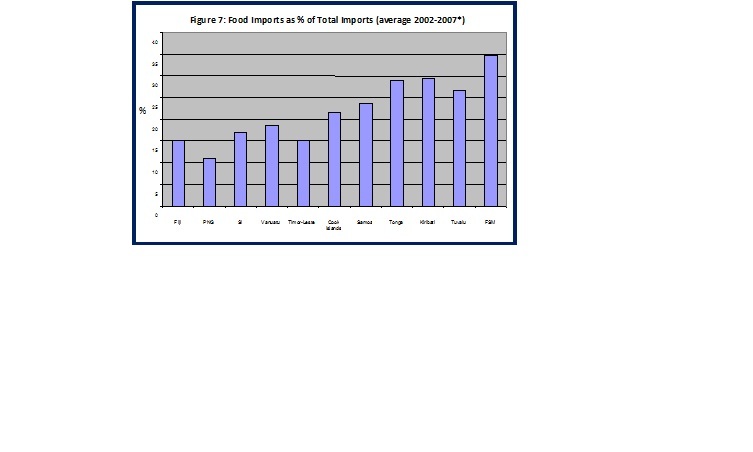 Total food imports have shown a steep increase from around US$17 million in 2000 to US$43.6 million in 2009. 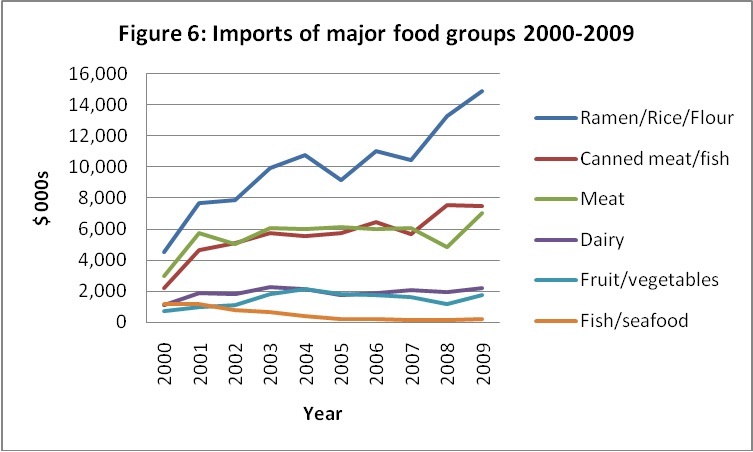 The imports of major food items are shown in Figure 6. Convenience starch foods including rice, ramen, noodles, flour and bread have been the major food items imported and this group has shown a steep rise over the last 10 years reflecting a change in diets away from traditional staples. The next most important imports have been canned meat and fish and meat products (poultry, beef, pork and hams). Fruits and vegetables and dairy imports have also risen from the 2000 level, but have maintained a rather constant level of around US$1.7 to 2.0 million from 2003 onwards. In contrast fish and other seafood imports have declined over this period to a value of around $200,000 a year. Food ($34.1m) and fuel ($29.5m) represented 46.6 percent of total imports ($142.6m) in 2007. Being heavily dependent on imported food and fuel and having very few exports the current high and volatile international petroleum and commodity prices have serious implications for FSM’s terms of trade. With current fiscal constraints the government cannot make costly market interventions to stabilize prices. Stimulating agricultural activity by creating an enabling environment for growth through investment in public infrastructure for marketing, storage and transportation can increase local production and reduce vulnerabilities to external food supply and price shocks. Diversifying the agricultural base, especially into higher value-added activities, and broadening export markets should also increase the range of economic opportunities for would-be entrepreneurs. The increasing levels of poultry, egg and pork imports (Table 1) imply an opportunity for some import substitution; however local commercial production relies heavily on imported feed and thus struggles to be price competitive with imports. Other issues for local production include limitations on air transport by the current monopoly air carrier of day-old chicks, suitable slaughter and hygiene facilities and appropriate food standards and regulations governing production and sales. 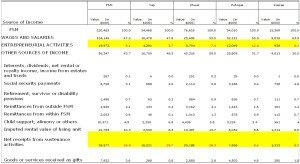 Opportunity for import substitution of fruits and vegetables as indicated in Table 2 is probably considerably less than $1.5 million a year as not all currently imported fruit and vegetable products can be readily grown in FSM. A better potential opportunity would be if significant substitution of imported starch products such as rice, noodles, ramen and flour could be achieved by encouraging greater consumption of local staples. This food group is now the largest import and reached a value of almost $15 million in 2009. Important in achieving such a goal would be increasing farm productivity to reduce prices, improving local transport and market facilities and developing processed products to reduce transport costs, extend shelf life and improve convenience. Promotion of community programs to grow and eat local foods for their nutritional and health qualities should also be supported. Additionally it may be possible to regulate the proportion of local food content used in government sponsored institutional canteens (hospital, government functions, school meals etc.). Fishing, tourism and agriculture have been identified as potentially important sectors for economic growth. But the country’s remote location and difficult transportation linkages, poor access to commercial and capital markets, poorly developed infrastructure and limited institutional capacity continue to constrain the potential for agriculture growth. However, the contribution of subsistence agriculture is likely underestimated and is fundamental for all of the states in providing livelihood options and resilience against external shocks. The informal sector plays an important and often unacknowledged role in the FSM economy. The majority of the FSM population lives in rural areas including outer islands and engages in subsistence and mixed subsistence production for their livelihood. Data from the 2005 HIES (Table 3) indicate that overall around 18 percent of FSM household income is generated from subsistence activities , but this varies across the four states with Yap (29.7%) and Chuuk (26.3%)relying more heavily on subsistence than Kosrae (8.5%) and Pohnpei.(8.4%). 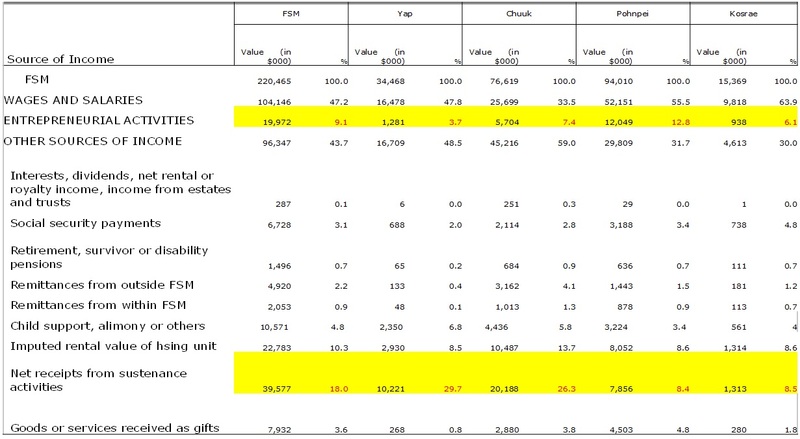 The HIES also indicated that 39.4 percent of FSM total household expenditures was on food and that 46.1 percent of this food was home produced with around 22.4 percent of this being farm products (highlighted in Table 4). An increasing shift back to subsistence farming in some states reflects the rise in global food prices and the loss of employment in the public sector. Preliminary data from the recent 2010 Population Census also suggest that the agriculture sector continues to employ a significant number of people in self-sufficiency endeavors and small commercial activities (Tables 5 & 6). Farm production is generally locally-based and small scale. Food is grown for local consumption and to support relatively small export sales in regional markets, primarily Guam and the Marshall Islands. The small land area and tenure systems generally limit large-scale commercial farming for export. Farmstead livestock production is important throughout the FSM, particularly for subsistence and cultural use. Copra was a former ubiquitous cash crop throughout the FSM, but production has now ceased almost completely due to inefficiency and volatile prices for copra, coupled with increasing senility of the coconut palms and transportation issues. The government-run Coconut Development Authority (CDA) is processing relatively small amounts of copra into virgin oil and other edible products. Rehabilitation of the coconuts industry is considered a priority, including replanting to replace predominantly senile palms. Despite the decline in copra trade the coconut is still an important component of farming systems, providing a wide variety of products both for domestic consumption and for potential exports. It provides the overstory in many of the traditional agroforestry farming systems and is one of the few trees that can grow in the harsh atoll environment being extremely resistant to drought. For the outer islands it is still by far the most important crop. Coconut products are still eaten almost daily and are always eaten at family and community feasts. The mature coconut provides not just fat, but significant amounts of fibre, protein and some substances that have antioxidant properties. Coconut cream can also be a useful source of protein. For atoll societies coconut flesh is the major source of dietary fat and energy, as well as contributing some iron, fibre, and other nutrients, and is prepared and consumed in countless ways. The coconut sector remains vital for outer-island livelihoods where few other economic opportunities avail. However, generally the sector needs to be restructured and revitalized with decentralization of oil expelling and a stronger focus on whole nut processing and value added products. Extensive replanting, preferably with higher yielding varieties, is now required. The potential of coconut timber processing in association with a coconut replanting program should also be explored. There is need for more private sector participation in processing and marketing activities and a review of the sector and CDA’s role is urgently needed. Most traditional FSM subsistence crops are of high nutritional value. These crops include – coconut, banana (particularly the karat anduht en yap variety which are rich in β-carotene), breadfruit and root and tuber crops (taros, yam and sweet potato) plus a variety of leaf vegetables and fruits. Most serve both as food and cash crops, have fairly flexible harvest period, and are grown successfully without heavy dependence on external inputs or extension services. In the atolls giant swamp taro Cyrtosperma chamissonis, and pandanus are also important food crops. Set against a backdrop of high cost of fuel and imported food and coupled with the growing threat of disease introduction there is potential for livestock to make a greater contribution to food security and sustainable livelihoods in FSM. Key challenges for livestock development are building local capacity in animal health and production, developing cost effective local feed sources, and improving hygiene and slaughtering facilities. Other localized challenges to developing commercial livestock ventures are water supply and investment for fencing and housing. Serious problems of nutritionally-related diseases occur in FSM, including vitamin A deficiency and anemia among children, diabetes, heart disease, and certain cancers among adults. These nutrition problems are mainly linked to the types of food eaten which is influenced not only by personal choices, but also by cost, ease of preparation, availability and accessibility. The National Plan of Action for Nutrition 2007-2012 sets out a clear strategic framework to help address nutrition-related health priority problems. It advocates incorporating nutrition goals and components into national development policies and sector plans, programs and projects, particularly in the areas of food and agriculture, fisheries, forestry, health, education, and environment. Increased production of local nutritious foods and strengthened local markets are important outcomes to be achieved. Additionally, use of endemic nutritious plants should be encouraged through education, outreach and effective communication. An overall proxy indicator of a country’s self-sufficiency in food is the level of food imports as a proportion of total imports. A country where food imports made up only a small proportion of total imports would be deemed to be more food self-sufficient. 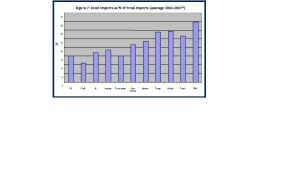 FSM has had on average a high proportion of food imports to total imports relative to other countries in the Pacific region (Figure 7) and this is another signal for the need to increase production and marketing of local food produce. Improved road and domestic shipping services along with better market houses and post-harvest storage facilities are essential requirements for boosting domestic trade in agriculture and fisheries products. Some Pacific island municipal marketplaces are outstanding in terms of the array and quality of produce on offer. These markets make a major contribution to small business development and food security. However FSM has yet to prioritize market infrastructure as a means to stimulate local food production and improve rural incomes. The responsibility for environmental issues is shared between the FSM National Government and the State governments of Chuuk, Kosrae, Pohnpei and Yap. Ownership of land and aquatic areas varies between States. In Kosrae and Pohnpei, land is both privately and State owned, while aquatic areas are managed by the State as public trusts. In Chuuk, most land and aquatic areas are privately owned and acquired through inheritance, gift or, recently, by purchase. In Yap, almost all land and aquatic areas are owned or managed by individual estates and usage is subject to traditional controls. In all states, land cannot be sold to non-citizens of the FSM, thus these land and aquatic ownership patterns greatly influence the strategies and actions required to sustainably manage the natural resources of the nation. Many islands in the FSM contain rich rain forests, which provide important resources for local inhabitants and a refuge for biodiversity. These forests are also critical to island hydrology, providing regular supplies of clean water and protecting the island’s delicate coral reefs, mangroves and seagrass beds from sedimentation. The States take the lead role in ensuring that development is avoided in vulnerable areas and ensuring critical natural systems are protected. Although there is still much to be done, most of the States have made initial efforts to guide sustainable development through the creation of: land use plans; coastal zone plans; and appropriate legislations and regulations. The challenge will be in implementing these plans and enforcing regulations in the face of increasing pressure on land use for economic development. FSM is a partner in the Micronesia Challenge where the five Micronesian governments (FSM, Palau, RMI, CNMI and Guam) will “effectively conserving at least 30% of the near-shore marine and 20% of the terrestrial resources across Micronesia by 2020”. This in turn provides the means for the FSM in achieving its Convention on Biological Diversity obligations. Climate and weather related events such as droughts, forest fires, typhoons, storm surges and sea level rise pose further stresses on the already vulnerable ecosystems in FSM. These natural phenomena become more pronounced in the face of land degradation caused by human activities. The high islands of Pohnpei, Kosrae, and Chuuk suffer from landslides and soil runoff, while the lower islands and atolls lose valuable shoreline every year, and have agricultural crops destroyed from sea water intrusion. Climate change remains an important policy priority for the FSM. In the 2004-2023 Strategic Development Plan, Strategic Goal 1 under the Environment section recognized the need for mainstreaming climate change into national planning as well as in all economic development activities. In December 2009, the President of the FSM issued an Executive Order directing all relevant sectors to update existing plans and complete them as a measure to bolster responses towards mitigating and adapting to climate changes The sectors include agriculture (and food security), energy, water, infrastructure, transport, finance, health, gender and other relevant sectors (FSM Climate Change Policy 2009). The continued appropriate and well-managed use of trees in agricultural systems (agroforestry and home gardens) can serve as an effective component of sustainable economic development and environmental protection in the FSM. Agroforestry practices can diversify farm outputs, improve productivity and reduce inputs, while mitigating some of the environmental damage caused by the past processes of deforestation and the removal of trees from the landscape. Agroforestry can also be a useful land management approach in buffer zones to watersheds and Protected Areas of conservation and can add capacity to global carbon sinks to mitigate global warming. It is also a land management practice that has much to offer in terms of nutrient cycling and ecosystem services required in organic farming. With climate change high on government’s agenda agroforestry warrants a high policy profile in the FSM. ADB, (2006) FSM- Toward a Self-Sustainable Economy 2005 Economic Report, 2006. Department of Resources and Development (1998).Proposed Agriculture Policies of the Federated States of Micronesia to increase the contribution of Agriculture to the FSm Economy. Recommendations of the National Agriculture Policy Conference held 27-28 July 1998, Palikir. Drew, W.M. (2008). Socioeconomic analysis of agroforestry and livelihoods on a small island developing state: a case study of Pohnpei, Federated States of Micronesia. Doctor of Philosophy Dissertation, University of Florida. FAO (Food and Agriculture Organization). (2009). Pacific Multi-Country National Medium Term Priority Framework Document 2009–2012, for the Cooperation and partnership between FAO and 13 Pacific Island countries. 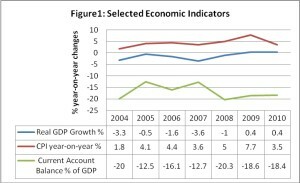 FSM Government (2007) Household Income and Expenditure Survey Analysis report Federated States of Micronesia 2005. Division of Statisitcs, Office of SBOC, Palikir, Pohnpei. Government of FSM (2007) National Plan of Action for Nutrition 2007-2012. 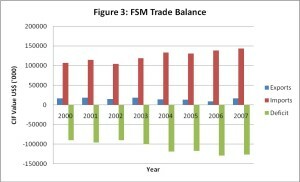 Government of FSM (2011) FSMTrade Policy. Department of Resources and Development, Division of Trade and Investment. Government of FSM (2011) FSMTrade Policy Annex 11 Implementation Matrix, Department of Resources and Development, Division of Trade and Investment. Office of Economic Affairs of Pohnpei State and the Secretariat of the Pacific Community (2010) Agriculture Strategic Action Plan 2011 -2015, Pohnpei State, Federated States of Micronesia. Raynor, W.C. (1991) Agroforestry Systems in Pohnpei – Practices and Strategies for Development. RAS/86/036, Field Document 4. South Pacific Forestry Development Program. United Nations Development Program.